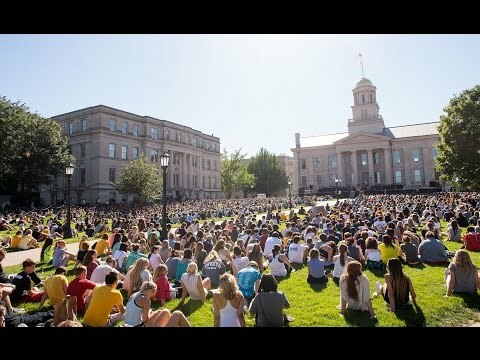 It’s another record-setting year at the University of Iowa. This fall the UI welcomed its largest, most academically accomplished and diverse undergraduate class in the university’s history. The class of 2019 is made up of 5,241 total students, 575 more than in 2014 (4,666). The first-year class also topped previous records in achievement, boasting 700 Old Gold Scholarship recipients, compared to 523 in 2014. Old Gold Scholars must have a 30 ACT (or combined SAT critical reading and math score of 1330), as well as a 3.80 GPA on a 4.00 scale. The first-year class also has the highest ever average high school GPA of 3.66, compared with 3.63 in 2014. Among first-year students, 47 percent (or 2,458) are Iowa residents, 41 percent (2,170) residents of other U.S. states, and 12 percent (614) international students. Students represent 99 of 99 Iowa counties; 50 states, as well as Washington, D.C., and Puerto Rico; and 26 countries, including the U.S. The UI’s most diverse incoming class ever has nearly 21 percent—1,082 students—identifying as African-American, American Indian, native Hawaiian or Pacific Islander, Asian, Latino, or two or more races. The percentage of minority students grew from 19 percent last year and is up from 12.6 percent in 2010. This year, 23,357 undergraduates are enrolled at the UI, compared to 22,354 in 2014. Total UI enrollment this fall is 32,150 students, compared to 31,387 in 2014. Graduate students total 5,688 (versus 5,804 in 2014), and professional students total 1,799 (versus 1,812 in 2014).